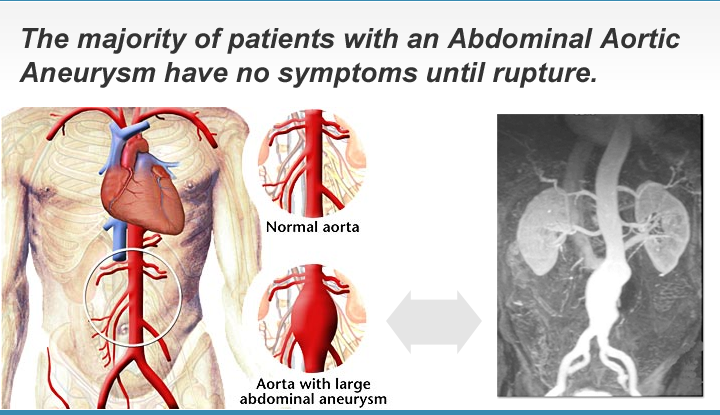 The majority of patients with an Abdominal Aortic Aneurysm have no symptoms until rupture. This screening uses ultrasound to view the abdominal aorta, the largest artery in the body, for a balloon-like enlargement. This highly hereditary condition is usually fatal if a rupture occurs. AAA is the 13th leading cause of death in the United States with 16,000 deaths per year. There are 32,000 people diagnosed with non-ruptured AAA each year. Ultrasound in the hands of an experienced vascular technologist can easily identify an AAA before rupture can occur. Purpose: To visualize and measure the Abdominal Aorta to detect an aneurysm or enlargement of the main artery of the body that could lead to rupture and death. Procedure: The technologist will apply an acoustic gel on your abdomen and use the ultrasound transducer to visualize the aorta and take measurements. Watch a short video about Abdominal Aortic Aneurysms and how we screen for them. Click Here For Package Discount Pricing!